The Bible assures us that each of us has been given gifts and St. Luke UMC will provide anyone who wants to with an opportunity to give those gifts back to God and our community. Whether you sing, play an instrument, dance, create decor, create graphics or visual art, design costumes, organize libraries or simply have the ability to encourage others, there is a place here for you to serve. No matter your age, we want you here — to work alongside others who love Jesus. Each of the service areas listed will offer more information on how you can serve. Join us! The St. Luke Chancel Choir offers music weekly at the 8 and 11a sanctuary Worship Services as well as special events throughout the year with various aspects of the entire ministry using media, sound, lighting, dance, drama. Although the presentations are different each time, they are exciting, challenging and lots of fun every time! Adults and high school students are invited to join the team. Choir rehearsal is at 6p on Wednesdays at St. Luke UMC in the David Frantz Choir Suite. Join us! 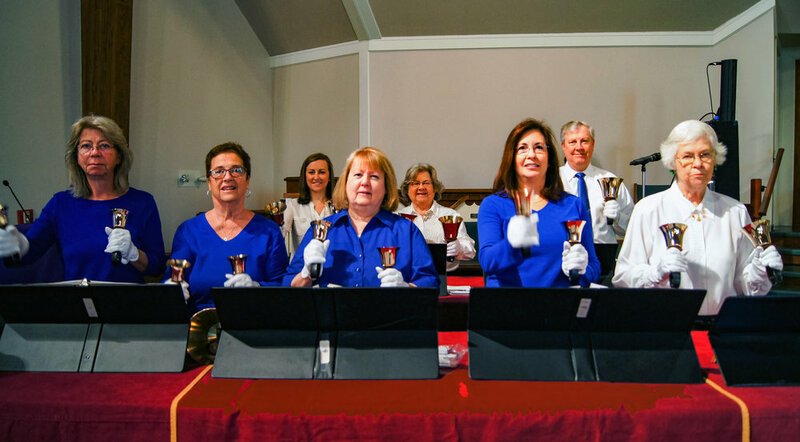 The St.Luke UMC Handbell Ensemble is directed by Ramona Williams. Experienced and new handbell ringers encouraged to join us. The ringers play for sanctuary worship services regularly throughout the year and participate in seasonal events and concerts. Rehearsals are on Sunday afternoons at 4p in the David Frantz Choir Suite. For more information or to become involved, please contact Ramona Williams. Our goal for our worship services is to connect people with God, whether that’s on a Sunday morning or by watching it online. If you would like to watch a Traditional Worship service, click here!